In a bid to develop its capital Amravati, the Andhra Pradesh government on Monday, 27 August 2018, listed bonds worth Rs 2,000 crore issued by AP Capital Region Development Authority (AP-CRDA) at the Bombay Stock Exchange. 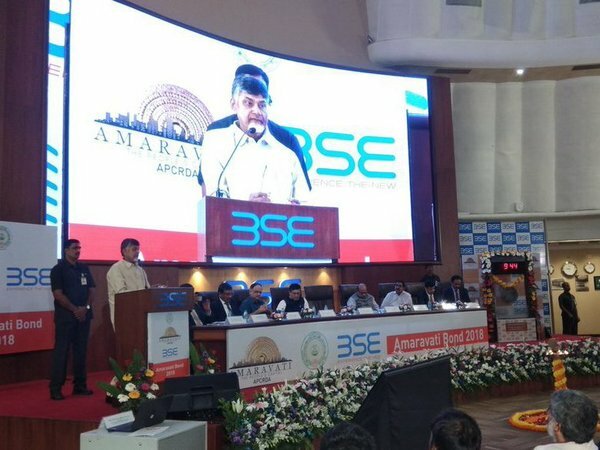 CM Chandrababu Naidu rang the opening bell, as the the government securities titled ‘Amaravati Bond 2018’ were listed on the Bombay Stock Exchange. While the bonds were issued for Rs 1,300 crore, they were oversubscribed by 1.53 times, thus raising Rs 2,000 crore of funds. The funds are being raised for the development of the upcoming capital, where projects worth nearly Rs 27,000 crore are underway while those worth Rs 11,000 crore are ready to be awarded. An amount of Rs 2,000 crore will be used as an equity pool and the government will keep investing towards equity contributions for various infrastructure projects at Amaravati. The bond issue was guaranteed by the Government of A.P. and was rated by CRISIL, Brickwork and Acuite supported by A.K. Capital Services as the sole arranger. Principal secretary (CRDA) Ajay Jain detailed the major milestones the State government had crossed in the construction of the capital city. State Planning Board vice-chairman C. Kutumba Rao said to start with, only a small portion of the ₹2,000 crore of the entire project requirement (Phase-I) of nearly ₹48,120 crore had been mobilised through bonds .